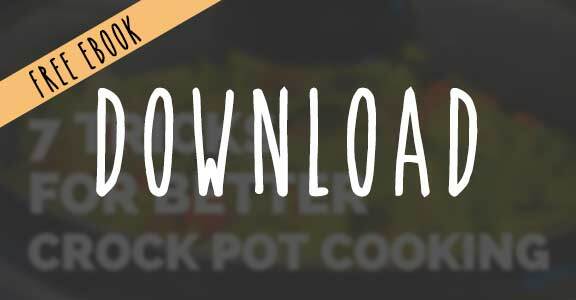 This Crock Pot dinner recipe is just amazing. I’ve made this Salsa Shredded Chicken Breast recipe numerous times already and every single time it’s a big hit cause it’s so delicious and versatile! So my Grain Brain challenge might not be going as well as it’s supposed to but at least I’ve been making a lot more gluten free choices and even low carb options! That’s a total win in my book already. I’m not being super strict on this challenge but I think I’m gonna try to give it my all the last few weeks. Anyway, we all know the Crock Pot is just amazing. It’s so easy and makes some fantastic foods in them. So I’ve been using it quite a bit lately. Yay. 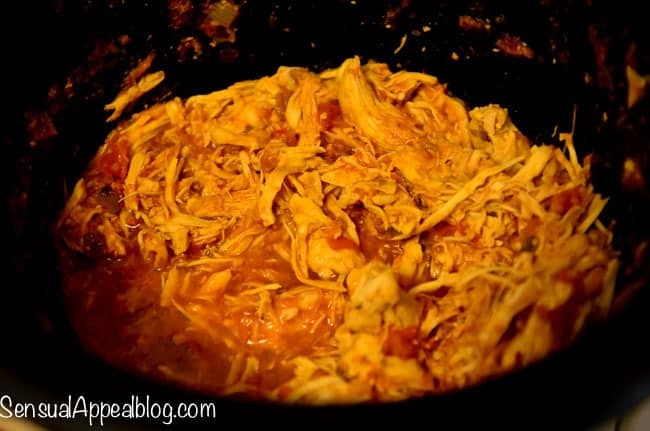 This Salsa Shredded Chicken recipe is one of the biggest accomplishments for me in the food department. Why? But they also rock when topped with Crock Pot Caramelized Onions (OMG! so good) on a bed of mixed greens for lunch! 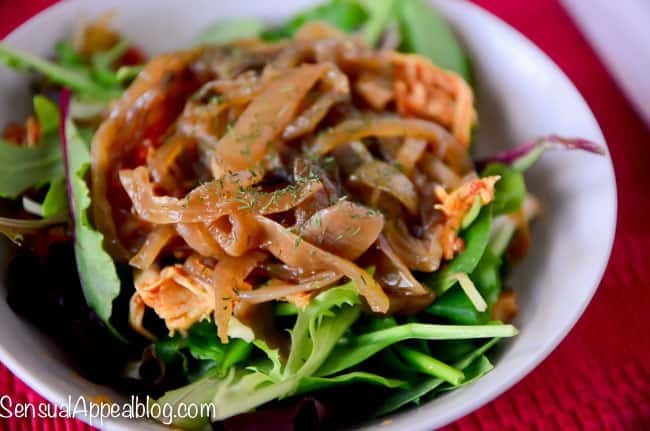 Not to mention I’ve been bringing a mixture of stuff with this Crock Pot Salsa Shredded Chicken as a salad to lunch with caramelized onions (mentioned above), mixed greens, cucumbers, and hummus – the whole thing mixed up is just HEAVEN. Not exaggerating. So good. I’ve posted about it on Instagram if you’re curious. Mmm…. I think I’m gonna go make this again tomorrow. It’s just so good! I don’t even wanna try looking for a new recipe, this is a total keeper. 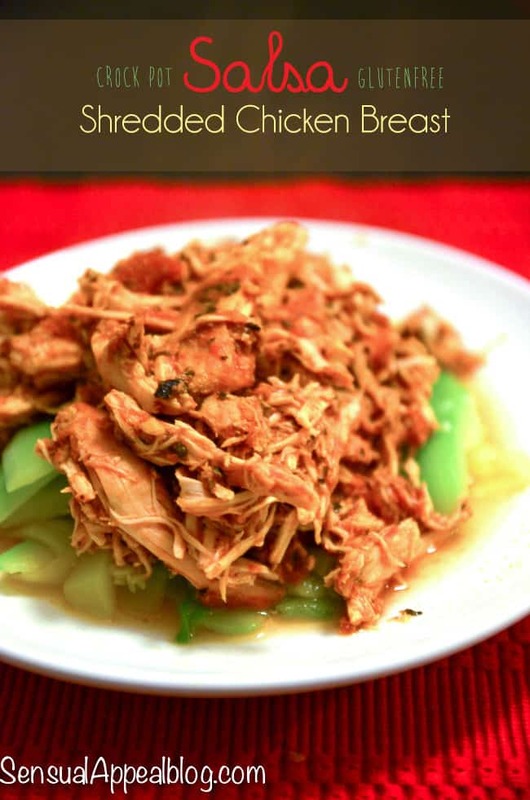 I use my crock pot a lot – and I love shredded chicken – usually in balsamic vinegar. But I will try this! Balsamic vinegar?! Hmmm that sounds amazing! I’ll have to try that! This sounds amazing!! I will definitely have to try it. I love breaking out the crock pot because it makes life so easy. Wow! Can’t ask for a simpler recipe than this one, that’s for sure. I also LOVE that it’s a 10 hour recipe. That’s waaaay more reasonable for a weeknight than 8 or 4 hour recipes (do you expect me to come home halfway through the afternoon, pop my food in the crockpot, and then go back to work? Seriously.). 10 hours is perfect! How perfect! I’ve had lots of readers asking me to put Gluten Free recipes on my blog! This looks like a great one! Thanks for the share!!! 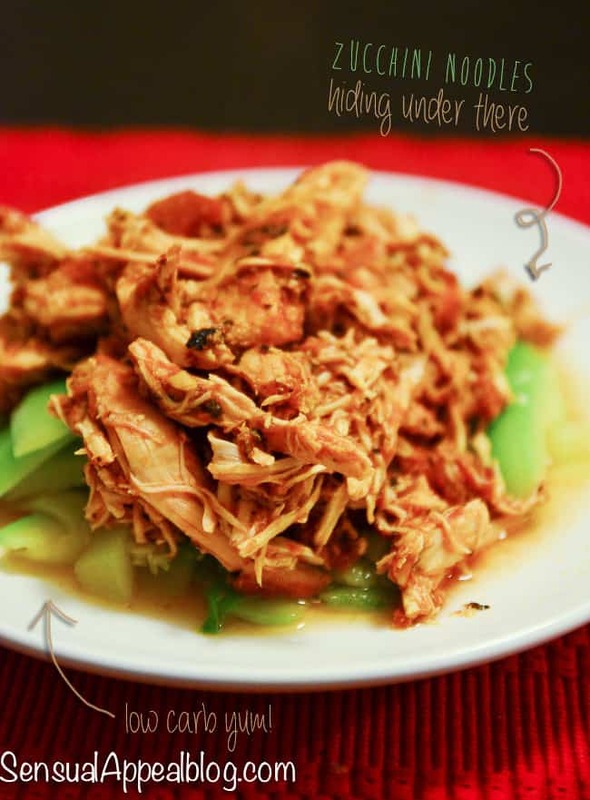 I absolutely and UTTERLY ADORE shredded chicken 🙂 This looks fabulous! But your pictures are awesome! Love them. Want to try to get mine better than just simple phone shots of food. Popped over from the SitsSharefest linky today and I also pinned your post to the Fall Sharefest board. Thanks so much! I bet it would taste great with corns and beans too! Great idea. Meanwhile, shred 8oz queso fresco cheese, which I found by the refrigerated tortillas in the grocery store. I am so in love with this cheese – it’s right up there with smoked gruyere, I tell ya’! Queso fresco is light and mild-tasting, kind of like a harder mozzarella, and pairs fantastically with the garlicky pulled pork. I cook this recipe all the time! 🙂 I got the variation from a friend. It’s so good! Do I cook this on high or low? I did it on low!